While much of this argument is based on a rise in anti-semitic attacks in Europe, it still has flaws. Let’s detail first where it is correct. 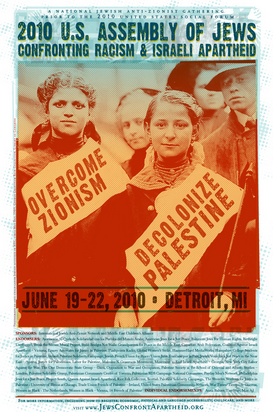 It notes that recent anti-Zionism is being used often as a cover for Anti-semitism. 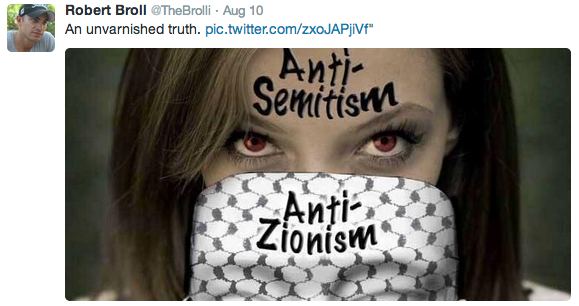 Similarly Anti-Zionism leads to anti-semitic manifestations. In France, the Gaza war, prompted riots by the Muslim minority and attacks on Jewish places of worship and shops. In the UK the Trycicle Theatre cancelled a Jewish film festival ostensibly over paltry support from the Israeli embassy and after trying to censor the films. But something strange also happens in Europe. Those who use anti-Zionism as an excuse to trot out attacks on Jews as a group turn themselves into martyrs by twisting around the situation and pretending they are victims of merely being anti-Zionist and being “bullied” by those who call them “anti-semites. George Galloway’s fascists speech where he declared his district a “Israel free zone” is an example. 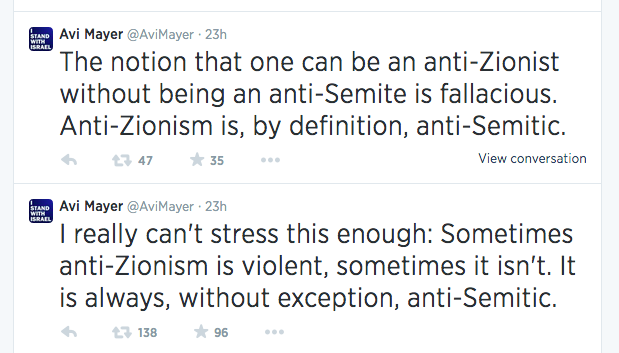 So why not conclude anti-Zionism is anti-semitism and be done with it? Because it isn’t helpful and likely helps lose two battles at the same time. Anti-Zionism should theoretically be the opposition to a variety of Israel’s policies and perhaps even the opposition to Israel in its present form. Many on the radical left in Israel are self-declared anti-Zionists or post-Zionists. At the same time many Jews abroad have been anti-Zionism. In the 1940s many Reform Jews were anti-Zionist in the US. Orthodox Jews also eschewed Zionism. In Europe Jews who had assimilated disliked Zionism and did not see it as a solution for the Jewish minority. As we know now the Holocaust changed all that. But many voices, such as Tony Judt remained, who saw Israel as an “anachronism” in the post-modern world. They didn’t want nation-states. Communists also objected. Were these groups all anti-semites? Much of the foundation of modern anti-Zionism was laid by Jews, were they all anti-semitic? Anti-Zionism has morphed into a whole variety of views. Among the more extreme and especially among Arabs, the view of anti-Zionism is essentially a view that Israel should not exist. Even among those Arab voices opposing Zionism, some have expressed clear nuance. King Abdullah I of Jordan penned an article in November of 1947 trying to explain it to an American audience. His views were not anti-semitic, in the opposite, he trotted out classic theories about Arabs being fellow semites and Jews and Arabs having a history of coexistence prior to Zionism. King Abdullah’s views do not exist among the rioters in Paris who attack Jewish shops. 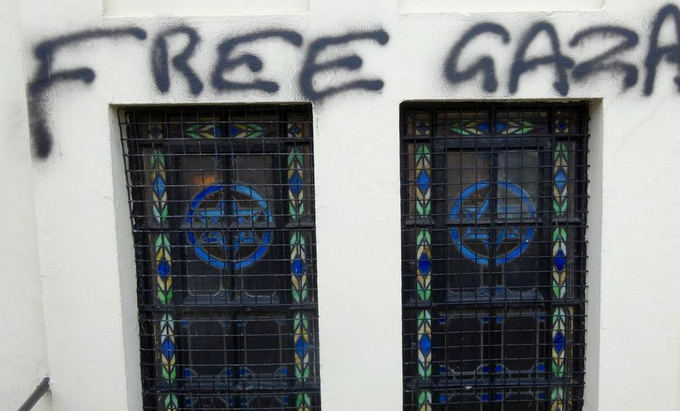 They don’t exist among the people who write “free Gaza” on synagogues. But the central problem with defining anti-Zionism as anti-semitism is it dilutes the ability to find anti-semitism and shame it, it aids anti-Zionists by turning them into “martyrs” who are “bullied and labelled anti-semities to shut down debate.” Consider the case of Stephen Walt and John Mearsheimer’s book ‘The Israel Lobby.’ They claim that any critique of Israel is rebutted by “charing critics of Israel with anti-semitism” which is a “tactic to marginalize anyone” who discusses Israel critically. They claimed that “anti-semitism” accusations was “one of the most powerful weapons” of “the lobby” against critics. They claim supporters of Israel invented the “new anti-semitism” to “shield Israel from criticism.” The book is replete with this refrain, about how Jews “play the anti-semitism card.” It was a self-fulfilling prophecy, they figured if they pre-empted criticism of their findings by claiming that they will be called anti-semites, then their book could not be labelled anti-semitic without it clearly being a “shield” for Israel. Inventive, smart, innovative strategy. Having done this, John Mearsheimer did one better. He decided in 2010 to create a “list” of “righteous Jews.” He went on to give speeches and write about this topic. And that is why it is important to have a line between anti-Zionism and anti-semitism. When all anti-Zionism is anti-semitism, it takes the shame away from the rioters who bash the windows of Jewish shops, the people who constantly berate Jews for being “an arrogant chosen people”, or the people who come up with lists of “good Jews.” It turns them all into anti-Zionists. This is the trick that no one sees. Calling them all anti-semites doesn’t make it so. Instead it just turns fascistic anti-semites, like George Galloway, into anti-Zionists. It turns the Hungarian neo-Nazis who also happen to hate Israel, into anti-Zionists. It turns all the people shouting “kill the Jews” at an “anti-Zionist” protest into “anti-Zionists.” Because the more there is an overlap, the more it is not mutually exclusive, the more everyone hides behind anti-Zionism. It allows all the crazy people like Baroness Jenny Tonge to pretend they are just anti-Israel. Nothing good can come with overly conflating anti-Zionism with anti-semitism. It defangs accusations of anti-semitism and also doesn’t help the debate regarding Zionism.